Hi my friends, I am posting another creation for Link Up for Pink to encourage all of you out there fighting breast cancer to never give up, "Fight Like a Girl". So my little cutie here is with her friend to "knock out" cancer. They have their gloves and are ready to help. So here we go and I hope you like it and it makes you smile. I think she is a real cutie and the images are from Lacy Sunshine called Eleanor and Pickles, We Fight Like Girls. Proceeds from purchase of this stamp are donated to Relay for Life and I think that is awesome. I used some CTMH stash paper and ribbon and embossed a diamond design pattern on the white strip, colored the images with my Copics, of course, just love those, and made it with Love. 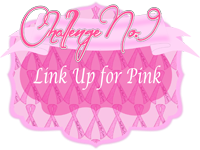 All of you Scrappers out there still have time to get your entry in for Link Up for Pink Challenge #9 not only for support for those who are battling for their life, but there are prizes to be won in each challenge. The prize for this one is a 4x6 stamp set from Stamps of Life. So until next time take care and God Bless. 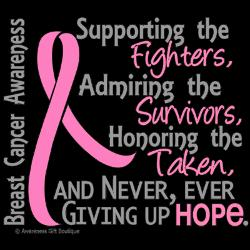 You've done a great Job with Heather's fabulous 'We Fight Like Girls' digi. Great colouring, colour choice and layout. Fingers crossed that Heather raises a lot of money from this digi for the cause. You should also enter this into our challenge. Thanks for joining us over at the Lacy Sunshine Challenge. Good luck. Adorable!!! Love your coloring Joanie! !